Somewhere Along The Line....Mechanics Rewired. "Unplugged” was a fashionable word in the 90s. Rewired may be the opposite, or it may quickly sink into irrelevance. Or not. Mike & The Mechanics present their seventh album. They have seen it all. They have had a number one hit in the United States, several Top 10 hits in Europe and the luxury to remain unknown while their fame was growing. Hardly anybody knew that the band had two lead vocalists or, on their first album, even three. The trio of Mike & The Mechanics has shrunk to a duo with the sudden death of Paul Young. 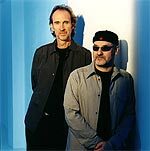 It is still peculiar that they decided to call themselves Mike & The Mechanics & Paul Carrack all of a sudden and to have some more mechanics join them. The new boys seem to be better at the computer than at their instruments. Rutherford must have wanted that, too. When Young passed on they did not want to go on with the band, but when Rutherford invited them all the decision was made: We’ll go on writing songs. Paul Carrack in particular enjoyed this freedom. He wanted to do something completely different, no matter if the result was marketed mechanically or shelved to gather dust. M6, indeed, sounded like a Paul Carrack album with Mike Rutherford as a session musician at times. Rewired has a different sound, despite Paul Carrack being the only singer on the album. He only sings on seven songs. 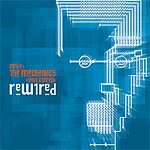 Rewired has almost nothing in common with the band that once looked Over My Shoulder or had a smash hit with All I Need Is A Miracle. Rewired is unique. Is that a good thing? Now what? Let us assume we would mention TripHop. Not even the reviewer has any idea what that means. But that is what the album sounds like. That does not imply “irrelevant”. If you have done everything in the mainstream and if you are able to top-flight songs like these, you have to end up with TripHop. Brave. One Left Standing is the first single, and it sounds like a mixture of Madonna and Fatboy Slim and Tricky. And Mike. And Paul. Rewired. Nothing acoustic. Acoustic guitars are plastered over with thick carpets of sound. Paul’s voice is put through the sequencer in every possible way about which the author of these lines has no clue at all. But that is what it sounds like. It is precisely because the brilliant If I Were You reminds one of the days of old that the title song jars our Mechanics soul. Song? Not quite. Paul Carrack sings a handful of words. You bet he has not sung them only for this one “song”. There is an instrumental, but where are the instruments? They are distorted, bended, locked away. Rewired. Is this really the band radio DJs play when they do not want to do anything wrong? Then again, they are full of wisdom: “I want a perfect child to live a perfect life” – that is almost embarrassing. But that song is the celebration of perfection. There is no better way to stage a melody than that. I Don’t Want It All, though heavily wired, reminds strongly of M6 because instability and calmness are so wildly mixed in it. Again, it is the melodies that make Mike & The Mechanics so strong, even in Rewired and however irritating the album may be. Electronic sounds cannot destroy the song potential of Falling or Somewhere Along The Line. The list goes on. Almost. An intricate piece of “instrumental” electronics is the final track on the album. Its sounds occasionally remind one of Up. After some 45 minutes one is left clueless. It is as if Wolfgang Petry [a German singer of syrupy love songs; translator] had recorded the jazz album of the year. Or as if Wes Montgomery had made a terrible pop record. Is it a comeback? Are they rewired? Or just retrofit? It is hard to describe. But that is why they are called Mike & The Mechanics, not Mike & The Acoustics. Only Paul Carrack seems to be beyond those things. No matter whether the record is good or bad. It took Rutherford some twenty years to really dare do something new. Things could be interesting live. Will Collins’ fans like it? Rewired could be called the courage that comes with having no plan at all. The concept of the bonus DVD is that of aimlessness. Eleven videos were included, one for every song and two each for Perfect Child and One Left Standing. They are all entertaining, some of them in animation, others in real film and others still in full weirdness. It certainly is a good idea to visually accompany each song. Peter Gabriel would need five years to do that, but the Mechanics just do it. In the end, wonders what the purpose of all this was and why the clips were put on a bonus DVD (in stereo, as was to be expected). It may turn out that Rewired is a concept album, with courage being the concept. Latest album featuring Andrew Roachford, Tim Howar and Arno Carstens on vocals. Self-titled album, though some call it M6. The last album with Paul Young, who died in 2000.